Air issues such as smog and acid rain result from the presence of, and interactions between, a group of pollutants known as Criteria Air Contaminants (CAC) and some related pollutants. CAC are produced from a number of sources, including burning of fossil fuels, and it is because of these shared sources that CAC are grouped together. HAMN continually monitors several of these pollutants at various air monitoring sites located around the Hamilton industrial area. The pollutants monitored include sulphur dioxide (SO2), total reduced sulphur (TRS), nitrogen dioxide (NO2), nitric oxides (NO), oxides of nitrogen (NOx), and inhalable particulate matter (PM10). Sulphur dioxide (SO2) is a colourless gas, belonging to the family of gases called sulphur oxides (SOx). SO2 smells like burnt matches. Natural sources of sulphur dioxide include releases from volcanoes, oceans, biological decay and forest fires. The most important man-made sources of sulphur dioxide are fossil fuel combustion, smelting, manufacture of sulphuric acid, conversion of wood pulp to paper, incineration of refuse and production of elemental sulphur. 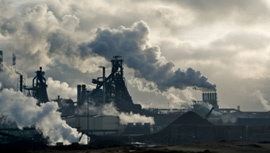 Coal burning is the single largest man-made source of sulphur dioxide. How do we measure SO2? U.V FLUORESCENCE: Absorption of ultraviolet radiation by SO2 sulphur dioxide is followed by fluorescence at higher wavelengths. Ambient air is drawn through a cell where it is irradiated with ultraviolet light. The resulting fluorescence is detected by a photomultiplier tube. The amount of fluorescence is a measure of the sulphur dioxide concentration. SO2 is measured continuously at the air monitoring stations. What are total reduced sulphur compounds? The main compounds that make-up TRS are hydrogen sulphide, methyl mercaptan, dimethyl sulphide and dimethyl disulphide. Most studies examine this mixture. These compounds are odourous at low very concentrations and relate to rotten eggs smell. Industrial sources of TRS include the steel industry, pulp and paper mills, refineries and sewage treatment facilities. How do we measure TRS? U.V FLUORESCENCE: Firstly, SO2 is removed from the sample gas. The sample containing TRS enters a high temperature converter and is converted to SO2. Absorption of ultraviolet radiation by SO2 sulphur dioxide is followed by fluorescence at higher wavelengths. Ambient air is drawn through a cell where it is irradiated with ultraviolet light. The resulting fluorescence is detected by a photomultiplier tube. The amount of fluorescence is a measure of the sulphur dioxide concentration. 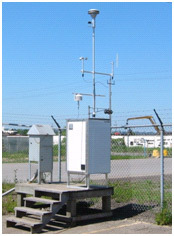 TRS is measured continuously at the air monitoring stations. What are Oxides of Nitrogen? Oxides of Nitrogen (NOx) include the gases nitrogen oxide (NO) and nitrogen dioxide (NO2). 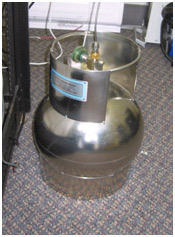 NOx is formed primarily from nitrogen contained in fuel and nitrogen contained in combustion air during combustion processes. NO emitted during combustion quickly oxidizes to NO2 in the atmosphere. NO2 is a reddish-brown gas with a pungent and irritating odour. It transforms in the air to form gaseous nitric acid and toxic organic nitrates. 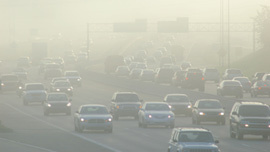 NO2 also plays a major role in atmospheric reactions that produce ground-level ozone, a major component of smog. Transportation, power generation, primary metal production and incineration are sources contributing to NOx emissions. How do we measure NOx? CHEMILUMINESCENCE: The analyser uses the principle of chemiluminescence detection. When two specific chemicals reacting together the resulting reaction will create a luminescence. Within the analyser when NO and Ozone react they produce a characteristic luminescence with an intensity proportional to the NO concentration. To measure NO2, NO2 must first be converted into NO before it can be measure by chemiluminescence detection method. This is done be using a high temperature (325 degrees C) NO2 to NO converter. The analyser continuously measures and records NO, NO2 and NOx readings. Particulate matter (PM) consists of airborne particles in solid or liquid form. It includes aerosols, smoke, fumes, dust, ash and pollen. Particulate matter is characterized according to size - mainly because of the different health effects associated with particles of different diameters. Some particles are emitted directly into the atmosphere. Other particles result from gases that are transformed into particles through physical and chemical processes in the atmosphere. Total Suspended Particulate (TSP) -airborne particulate matter with an upper size limit of approximately 100 micro metre (µm) in aerodynamic equivalent diameter. Particulate Matter <10 microns (PM10) - also referred to inhalable particulates, are airborne particulate matter with a mass median diameter less than 10 µm. A variety of emission sources and meteorological conditions contribute to ambient PM10. Particulate Matter < 2.5 microns (PM2.5) – also referred to as respirable particulates are airborne particulate matter with a mass median diameter less than 2.5 µm. How do we measure particulate matter (PM10)? TEOM-MASS CONCENTRATION: A TEOM (tapered element oscillating microbalance), is a micro weighing technology that provides true mass real-time measurements of particulate matter. The sampling head is outfitted with a PM10 size selective inlet. A sampling filter is mounted on the microbalance, sample gas deposit particulates on the filter reducing the microbalance frequency. This reduced frequency is directly proportional to the amount of mass on the filter. A mass flow controller maintains the sampling flow to calculate the mass concentration in µg/m3. BETA RADIATION: At the start of the sampling period, beta ray transmission is measured across a clean section of filter tape. This section of filter tape is then mechanically advanced to the sampling inlet. Particulate matter is then drawn into the sample inlet and deposited on the filter paper. At the completion of the sampling period, the filter tape is returned to its original location and the beta ray transmission is re-measured. The difference between the two measurements is used to determine, with exceptional accuracy, the particulate concentration. The sampling head is outfitted with a PM10 size selective inlet. THE 5030 SHARP CONTINUOUS AMBIENT PARTICULATE MONITOR consists of a C14 source, detector and a light scattering Nephelometer in a rack-mountable enclosure. It distinguishes itself from other beta gauge measurement methods by utilizing a continuous (non-step wise) hybrid mass measurement with two proven industry technologies, which provides for long term unattended operation. It automatically advances the filter tape based upon a user defined frequency or particulate loading. VOCs are emitted into the atmosphere from a variety of anthropogenic sources. Some of the major anthropogenic and natural sources include vehicle, fossil fuel combustion, steel-making, petroleum refining, fuel-refilling, industrial and residential solvent use, paint application, manufacturing of synthetic materials (e.g. plastic, carpets) food processing, agricultural activities, wood processing and wood burning. A number of VOCs play an important role in the formation of ground-level ozone and PM2.5 which contribute to Smog. How do we measure VOCs? Specialized, non-continuous sampling and analytical techniques are required to measure VOCs because they are usually present in the atmosphere in extremely low concentrations. HAMN carries out VOC monitoring at three sampling locations in Hamilton. Analysis is carried out for 34 common parameters, such as Benzene Toluene and Xylene. Samples are collected into an evacuated stainless canister. Samples are analyzed in an Organic laboratory using Gas Chromatography/ Mass Spectrometry (GC/MS). Total Suspended Particulate matter, (TSP) which is all airborne finely divided solid or liquid material with an aerodynamic diameter smaller than about 44 microns. It includes very coarse (diameter >10microns), PM10 and PM2.5 particles. How do we measure TSP? A High volume sampler is a 24 hour sampler that collects airborne particulate. The flow rate is controlled at 40 cubic feet per minute (CFM) using a mass controller. All samples are collected on a pre-weighed glass fibre filter which is analyzed for particulate mass concentration and further analysis is carried out for various metals, such as, Lead, Iron, and Copper. Polycyclic Aromatic Hydrocarbons (PAH's) are a group of different chemicals that are formed during incomplete burning of coal, oil , gas, garbage or other organic substances. PAHs are usually found as a mixture of containing two or more of these compounds. How do we measure PAHs? A modified high volume sampler with a Teflon filter is used to collect samples. 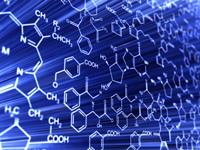 PAHs are analyzed in an Organic laboratory using Gas Chromatography/ Mass Spectrometry (GC/MS). Analysis is carried out on 8 common parameters such as, Benzo (a) Pyrene.